Perry's Nut House, a Route 1 fudge and nut shop and iconic tourist stop is looking for a buyer. The owner says he wants to retire so someone else can breathe new life into the 90-year-old business. 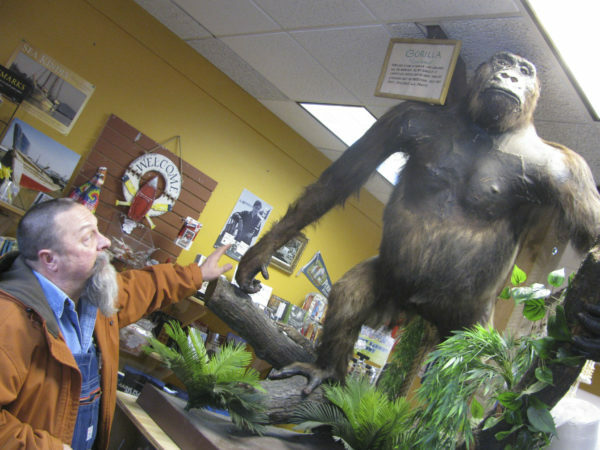 Howard Whitten, taxidermy teacher at Nokomis Regional High School, checks out Ape-raham, the lowland gorilla mascot of Perry's Nut House on Route 1. 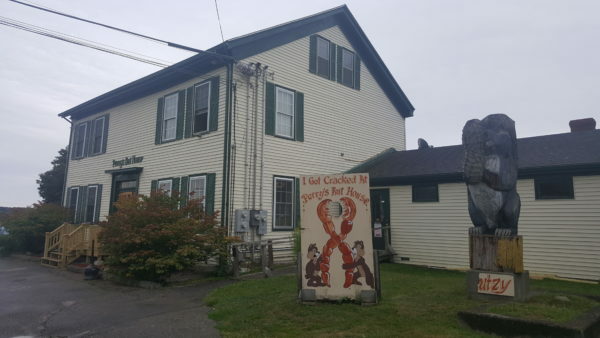 BELFAST, Maine — An iconic, 90-year-old midcoast roadside attraction known for its fudge and the giant pink triceratops skeleton out front is on the market. The current owner says he’s looking for a buyer who will keep the business going. Perry’s opened in 1927 in an old captain’s house, selling pecans and assorted nuts along the bustling Route 1 corridor. The owner, I.L. Perry, did a lot of traveling and liked to collect oddities and bring them back to decorate his business. This evolved into a quirky museum featuring curiosities ranging from trick mirrors to a stuffed water buffalo purportedly shot by President Teddy Roosevelt. The knick-knacks inside the business were as much, if not more, of a draw as the products Perry sold. After Perry’s death in the 1940s the business changed hands many times. Around the turn of the millennium, the business struggled, and Perry’s closed its doors in 1997, auctioning off the bulk of its unusual museum collection. The store itself reopened a year later, selling fudge, nuts and other assorted treats. It retained a smaller collection of oddities, including stuffed animal specimens — most notably Ape-raham, a century-old stuffed lowland gorilla that was fully refurbished in 2012. Darling moved to Maine with his wife, Ellen, in 2003 after years of visiting the state with his family on vacations. After arriving, he decided to purchase Perry’s in 2004 with the belief that his daughter would one day take over the business, but she started a career in another industry. “I certainly never intended to own this place for 13 years,” Darling said. Despite losing much of its quirky museum feel in late ’90s, Perry’s has seen its business grow over the past decade, according to Darling. When he purchased the business, it produced and sold less than 4,000 pounds of fudge in a year. That number has since grown to 13,000 pounds. “I’m looking for somebody who has the drive to push it a little bit further,” Darling said. “I’m too old to really have that ‘umph’ for it that I used to have.” Darling said he and his wife want to retire and travel, but need to find the right person to take over the business. He’s tried selling the business several times over the years through multiple real estate agencies, but hasn’t received any offers. The listing price for the property, which is home to three separate retail spaces and a pair of apartment units, is $625,000. Perry’s could lose some of its iconic pieces in the transition. Several people have expressed interest in purchasing Ape-raham. Nutsy, a large wooden squirrel sculpture in front of the business, also could be on its last legs because it’s badly rotten and becoming a hazard, Darling said. The giant pink triceratops out front actually belongs to the jeweler that rents space from Darling, so its future likely would be up to a future owner or the jewelry store.